Prepare to fully immerse yourself in Italy's finest art, architecture, culture, and landscapes with Capritime's complete tour of the most iconic destinations and sights on the Italian peninsula. This fabulous trip combines cultural activities with walking tours through Venice, Florence, Rome, and Capri. As an intimate group you will enjoy an in-depth introduction to the art, architecture, archaeology, and beautiful landscapes of Italy. Nothing stirs the heart more than Venice's languid beauty. In this unique city of color and light, built 15 centuries ago on sandy islets located at the mouth of the Adriatic Sea, Venice still seduces in a way few other cities can. 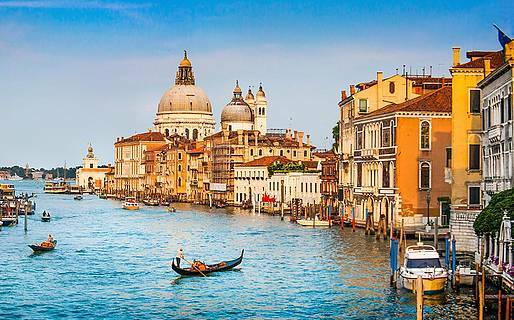 Whether it's sauntering up the quay of the Grand Canal at dusk, enjoying a favorite Titian canvas in a quiet little parish church, or marveling at how tiny cubes of colored glass and gold form some of the world's finest Byzantine mosaic work, the visual delights of Venice are unparalleled. Our day begins in St. Mark's Square admiring the beauty of the Ducal Palace and St. Mark's Church. We will explore together the intricate maze of old, quaint backstreets and canals, delight in the bustle of the main local market at Rialto and enjoy the dazzling Grand Canal with its hundreds of old palaces. Later we will attend a private mask making demonstration and conclude the day amidst the magnificent décor of Ca' Rezzonico, an 18th century palace on the Grand Canal. After dinner, enjoy a romantic gondola ride for two. 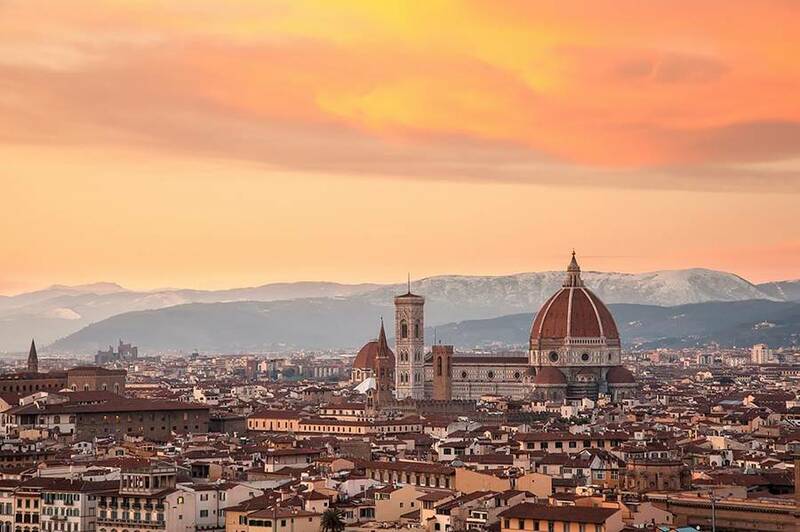 On day three we will travel to the fascinating Renaissance city of Florence, where we will spend three glorious days. Home to some of the greatest architectural monuments in the world, its museums hold the patrimony of Italian Renaissance art. 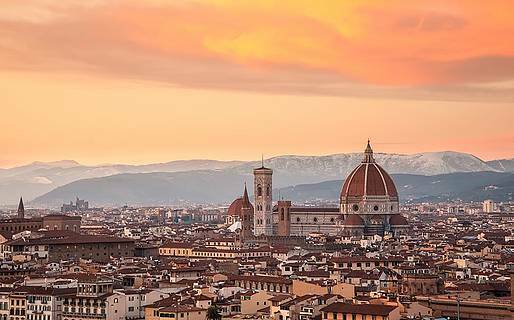 Enjoy a walking tour through the streets of Florence discussing the art, architecture, history and folklore. See sites such as Brunelleschi's Duomo, Giotto's Bell Tower, Palazzo Vecchio, Piazza della Signoria and the Ponte Vecchio. 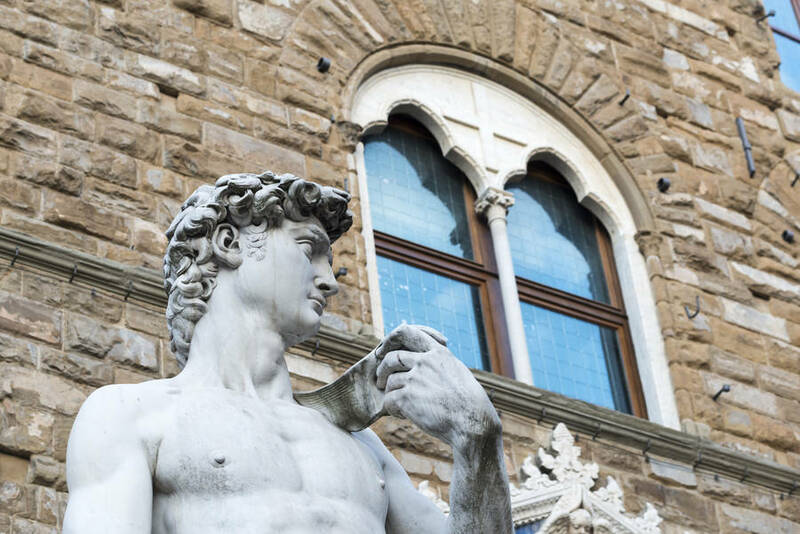 Visit the Accademia and Uffizi for an unrivalled opportunity to see some of the greatest works of the Renaissance including masterpieces by Leonardo Da Vinci, Botticelli, and Michelangelo. 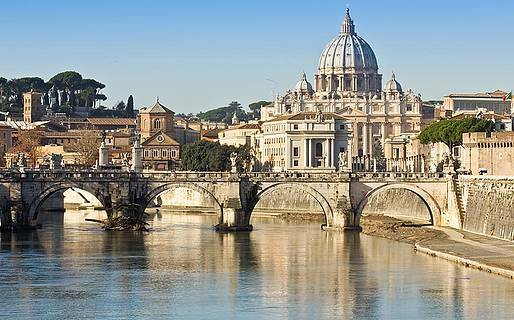 We travel to Rome on day six for a two night stay in the Eternal City. Step back in time with a visit of the Colosseum and imagine the excited crowds as they watched the battle between men and beasts, walk along the ancient sacred way following the triumphal route through Rome's monumental forum up to the Capitoline hill. Enjoy the layering of the different styles of architecture as you hear about Rome's history and see it unfold as it comes to life from its humblest beginnings on the Palatine to its later expressions of wealth and grandeur under Emperors and Popes. 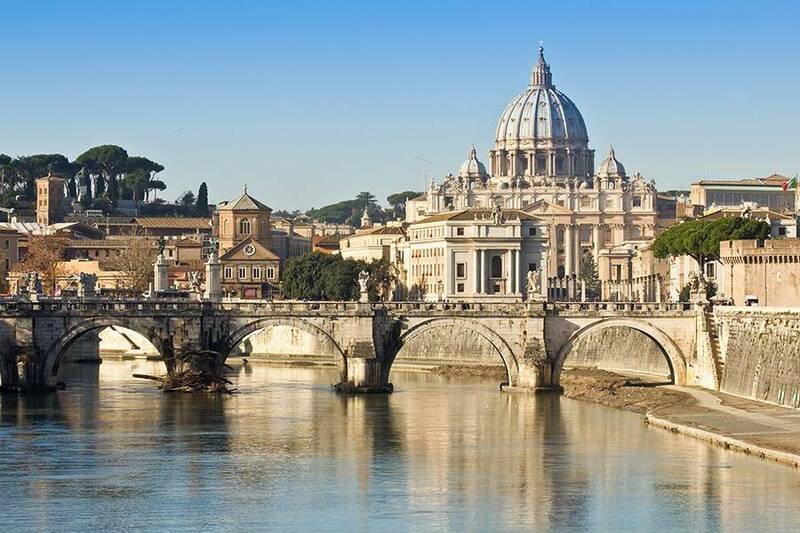 Spectacular achievements designed to convey power and authority continue to punctuate the walking tour which also includes the Pantheon, Piazza Navona, Spanish steps, Trevi fountain and a special entrance to the Vatican Museum has been arranged for our group. Italy most beautiful island is our final destination and we will spend our days reveling in the natural beauty of this island paradise and our nights enchanted by the songs of the sirens. 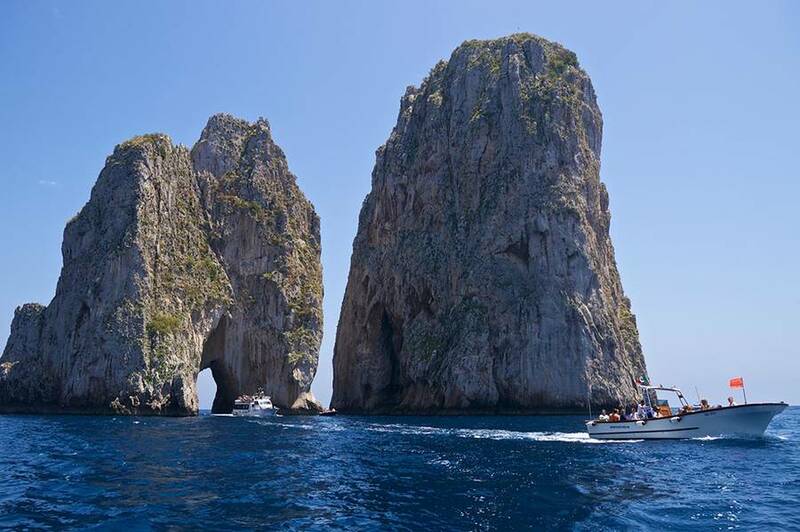 We arrive in style on a private boat from Naples and spend the next two days exploring this mythical island. 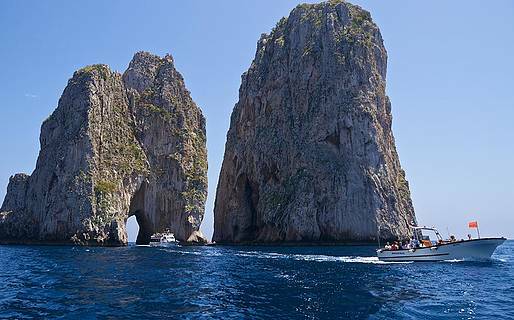 No trip to Capri would be complete without a boat tour around the island, including the Blue Grotto for which Capri is world renowned. Meals are in local taverns which feature island specialties such as mozzarella grilled between lemon leaves, the day's fresh fish catch, followed by the homemade lemon liqueur, limoncello. Rebecca Brooks, founder of Capritime Tours, will accompany guests on the "Treasures of Italy" trip. Rebecca holds her Master of Arts degree in Italian Studies from the University of California, Berkeley. In Italy, Rebecca followed several courses at the University for Foreigners in Siena and enjoys the rare privilege of being a member of the Nobile Contrada del Nicchio. She has been sharing her love of Italy with travelers since 1994 and is waiting to share the Treasures of Italy with you! Special entry to the Vatican, Uffizi, & Accademia Museums - No waiting in line! To ensure individual attention, scheduled group tours are limited to 16 participants. Private groups of all sizes are welcome; contact Capritime to schedule your special departure dates.